After decades of working as a Saury wine barrel cooper, Pascal Collotte had always said that he would never buy a vineyard unless it was utterly perfect in every way, complete with a pond, an orchard and rolling pasture. Secure in his skepticism that nothing so perfect could possibly exist, everything changed when he laid his eyes on the Château Jean Faux. His purchase of the property in 2002 is proof positive that Bordeaux is still full of surprises! Just outside the appellation limits of Castillon, this property is located on fairly steep slopes dominated by pine trees, which create a micro-climate. At the bottom of the slope is a small river that also has a tempering effect. 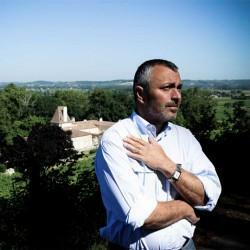 Pascal's first vintage was in 2003 under the guidance of consulting winemaker Stéphane Derenoncourt, with whom the château has worked ever since. Château Jean Faux has been practicing organic since 2009. The 2007 is drinking deliciously right now, with loads of fruit and undertones of smokiness. This wine is the product of a couple who lives for entertaining with the "fruit" of their property, and is a clear extension of their love of nature. With impressive length and present tannins, this wine has an ageing potential of 10-15 years.